High school students commonly excuse themselves from class to use the bathroom, then use the trip to take furtive hits of nicotine-laced vapor from e-cigarettes. 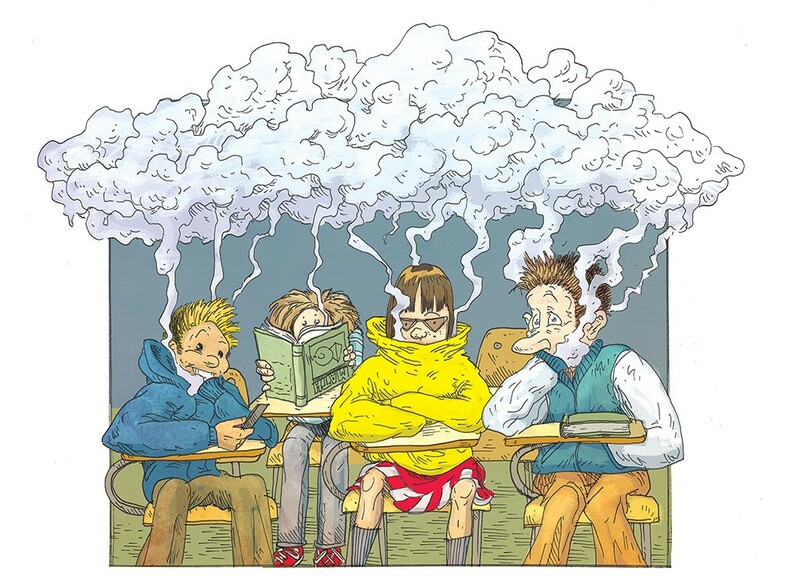 Some go a bolder route: They'll take a hit of an e-cig, usually a Juul, while the teacher's back is turned. By the time the teacher turns around again, the vapor has dissipated. "It's infested our school community," said Montia Peart, an Essex High School senior, echoing what students and employees from three Vermont schools told Seven Days. The sleek devices, which often resemble USB flash drives in size and style, are essentially cigarettes reimagined for the digital era, delivering hits of vapor from pods that have no tobacco but contain as much nicotine as a pack of cigarettes. Juuls are "pretty prevalent," said Montpelier High School senior Willem Slade, so much so that the brand has become part of the teen lexicon. "Juuling in the bathroom, any free time you have; in the back of class because they're so easy to conceal," he said. The data support Slade's observations. Nationally, 1.5 million teens picked up the habit last year, a near doubling of use by high school students since 2017, according to the U.S. Food & Drug Administration. The 2017 Vermont Youth Risk Behavior Survey found that one third of the state's youths had used an e-cigarette, and one in five said they'd vaped during the previous month. The 2019 survey is currently under way, and health experts expect user rates to be dramatically higher. Last December, U.S. Surgeon General Jerome Adams declared youth nicotine dependency an epidemic. To combat the problem, the FDA recently released a draft policy intended to limit the number of flavored e-cigarettes — which teens are more likely to use — on the market. The rules would also require stores to sell such products in areas off-limits to minors; online retailers, meanwhile, would need to use third-party age verification services. The changes would take effect in August 2021. In Vermont, lawmakers are considering three bills this session that proponents think could help curb youth use. "Sometimes it takes a crisis," said Rep. George Till (D-Jericho), a physician and longtime advocate for stronger tobacco regulation who sponsored two of the bills. "The vaping thing has just totally turned this discussion around." Seven Days spoke with several Vermont high schoolers to get their take on the proposed laws and what they think might work. One bill, S.86, would raise the legal age for purchasing tobacco products — and e-cigarettes — from 18 to 21. The Senate, which rejected similar legislation in 2016 and 2017, approved the measure on March 1, and the bill was sent to the House for consideration. Would that law discourage teens from vaping? The 2017 Vermont survey found that nearly half of the students who used e-cigarettes obtained them from other people, and teens confirmed that's common. "Some students at our school are 18 already, or students have friends who are 18, and it's really easy to ask upperclassmen," Slade said. Montpelier High School senior Nadia Scoppettone said the measure could effectively restrict students' access to vape products. "There are some people who are 21 who might buy you a Juul, but a lot fewer," she said. "And, like, a 15-year-old probably doesn't know a 21-year-old that's gonna buy you a Juul." Slade and Scoppettone are both 18 themselves and have been asked by younger peers to buy them pods. "It's just super uncomfortable," said Slade, adding that he'd turned down the requests. Another bill, H.47, would extend the current 92 percent tax on cigarettes to all tobacco products, as well as e-cigarettes. In his January budget address, Gov. Phil Scott, who has generally opposed new taxes, called for a new levy on electronic nicotine products, citing the need to deter youth. The House passed H.47 in early February, and the Senate is considering it. Although higher prices would likely discourage teenagers who haven't picked up vaping, many teens doubt that it would stop their peers who are already hooked. Among those is a 16-year-old New Haven boy who described himself as "quite addicted to vaping." "I usually go through a pod a day," said the teen, who asked not to be identified and communicated with Seven Days via text. A new tax would be an annoyance, the boy said, but not a barrier. Vaping is already expensive, he noted, but he has ways of resupplying at a lower cost, such as getting vapor cartridges from friends. "There are knockoff brands that are cheap," he texted. Still, several high schoolers told Seven Days a price increase would have some impact. "It's not like teenagers have unlimited money," Scoppettone said. One online Juul "starter kit" — which includes the device, a charger and four pods — sells for $29.99. The kits are currently subject only to Vermont's 6 percent state sales tax, so expanding the cigarette tax to e-cigarettes would nearly double the price. But that likely wouldn't stop youth use altogether. "Addiction overrides pricing for anything," noted Brooke Jette, a prevention specialist at Middlebury Union High School. The third bill was sparked by concerns that e-cigarettes can be purchased online without rigorous age verification; it would restrict e-commerce to licensed vendors. The House passed H.26 on March 13, but many students don't think the measure would have a large impact. The Vermont survey found that only about 10 percent of young users obtained vaping supplies online. Several students noted that parents often disapprove of vaping and could easily intercept packages. Any measure of deterrence is worthwhile, said Montpelier High School principal Mike McRaith, who supports all three proposals. "They're not going to keep kids from vaping altogether," he said. "But it will help." Justin Hoy, the director of prevention services at Essex CHIPS, a youth-focused community health nonprofit, agreed. "They're all better than what we have right now, which is nothing," he said. Alex Morano, who owns the Valley Vape Company in Essex Junction, said she would like to see more "nuance" in the regulations. She does support e-commerce limits and restricting legal purchases "to an age that doesn't typically attend high school." Morano, though, fears the tax proposal would harm businesses such as hers. Gas stations and convenience stores could survive the tax hike because they sell other products, she said. No research yet exists on the long-term health effects of vaping, but nicotine is dangerous for teens. The surgeon general warns that it can harm development of the regions of the brain responsible for attention and learning, increase the risk of mood disorders, and permanently harm impulse control. Nicotine can "prime the adolescent brain for addiction" later in life, according to the surgeon general's website. Students find health warnings unconvincing. "We see people ... who have smoked cigarettes their whole life, and we see how that's a big impact on them, and we don't think it's cool, or whatever," Scoppettone said. "But with Juuling, there's no cautionary tale." Some students don't even realize they are addicted. "Kids never think they're going to have a problem," said Remi Savard, another Montpelier High School senior. "And when they do, they don't really believe it." Most students lack awareness about the potential consequences of addiction, said Scoppettone, and "don't talk about how that impacts your life or how that can impact your future." She added, "They don't really consider it as, like, an addiction to a drug. It doesn't look like a drug." Scoppettone believes that many are confident they can quit whenever they want: "They don't actually expect to be dependent on it their whole lives." Slade described students making offhand jokes about addiction "without really giving it too much thought." The New Haven boy who texted with Seven Days said he has been vaping for a year and grew worried as he watched his use increase over time. He once sold his Juul in an effort to quit, but he ended up using his friend's so often that he just bought another one and grew resigned to his habit. Experts emphasize the importance of educating youth about the health risks and addictive qualities of nicotine. High school students said a cultural shift is needed. Juuling isn't only accessible, it's cool. For anything to change, said Ramona Bilodeau, a senior at Essex High School, "teens need to realize it's not normal." Bilodeau, along with the other high schoolers in Above the Influence, a peer leadership group facilitated by Hoy at Essex CHIPS, is trying to make a difference. The group has given an educational presentation titled, "E-Cigs, Vaping, and Juul: What You Need to Know," to every middle school class in the Essex Westford School District. Principal McRaith said he addresses the subject, too. "The angle that I've taken with our students is ... they're being taken advantage of by for-profit companies who understand that teenagers would be drawn to this kind of seemingly adult behavior and product," he said. But unlike other fads and trends, he tells them, this one is addictive and hard to quit. Health educators in schools across the state have updated their drug and illicit substances curriculum, adding coursework on e-cigarettes and vaping. Rhonda Williams, the chronic disease prevention chief for the Vermont Department of Health, said the state is taking "aggressive action." The New Haven youth who is addicted said that restricting e-cigs could have a perverse effect: "I just know that the harder they make it to get, the more I want to get it, honestly, if that makes any sense." He raised a point reminiscent of Vermont's emerging approach to another addiction problem, the opioid crisis. In recent years, the response has shifted from law enforcement to public health. Simply making vape products harder to obtain is not the answer, the teen said, telling Seven Days that "If adults want us to stop vaping, they need to find ways to help addicted kids."